Clear, concise and timely diagnostic reports are at the core of our service offering. Our medical staff is focused on delivering a high quality and comprehensive diagnosis that meets the needs of our clients and their patients. 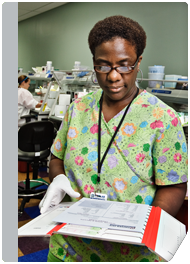 In addition, our Memphis-based laboratory is designed to deliver the fastest turnaround time in the nation. OncoMetrix provides preliminary pathology results to its nationwide client base within 48 hours. Below are samples of the diagnostic reports delivered by OncoMetrix. Our comprehensive SCOPE report is a definitive diagnosis that summarizes the test results for each patient. If you are interested in viewing a specific diagnostic report, please contact your local sales representative. Our comprehensive AFFIRM DX report, which is designed for the hospital based pathologists who incorporate their own morphologic evaluation, is a definitive diagnosis that summarizes the test results for each patient. If you are interested in viewing a specific diagnostic report, please contact your local sales representative.